My dendrochronological research is focused on musical instruments, mainly from the violin family. Therefore using a scanner is not an option, as violin tops are always arched. Accordingly I have always been working with a photo camera. I use a reflex camera, Nikon D80, together with a 150mm macro lens. But any lens with a focal length of 100mm or higher will be suitable for dendrochronological analysis. It should, however, be a macro lens. True macro lenses are fix-focal lenses, which means that their optical design is optimized without compromises for one focal length, resulting in sharp and virtually distortion-free images. Most of the ordinary lenses, on the contrary, are zoom lenses which usually suffer from barrel distorsion at one end of the zoom range and from pincushion distortion at the other end. Only a small part of the range is free from distortion. Additionally, the minimum focusing distance of these lenses is significantly higher than that of macro lenses. This means that you will not be able to get close enough to the sample, resulting in photos with a too low resolution. However, also macro lenses would produce low resolution photos if I would insist on taking the picture with a single shot. 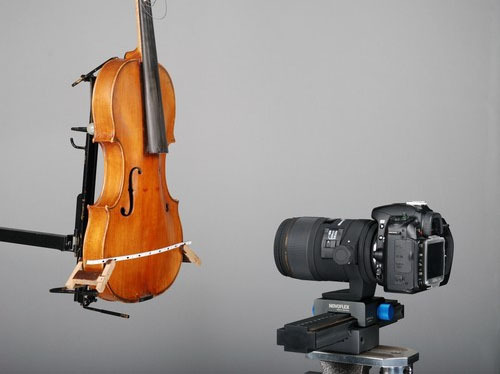 When photographing half a violin top plate (ca. 10cm) with a 10MP camera the resulting resolution would be about 980dpi, which is much too low for serious measurements. My minimum requirement for violins is 2500dpi (ca. 0,01mm/dot); I am a little bit less demanding as far as cellos or double basses are concerned (2000-2200dpi), as they generally have a higher average ring width. The trick to nevertheless achieve the required resolution is to take partial photos which can be put together with a stitching software. "Photo stitching is the process of combining multiple photographic images with overlapping fields of view to produce a segmented panorama or high-resolution image" (from Wikipedia)(1). I will describe my method using the example of half a violin top plate. First I put a ruler made from paper across the violin. The ruler has markers (black rectangles) at 25mm intervals to aid with framing. As I already mentioned, dedicated macro lenses have no zoom mechanism, therefore I adjust the distance of the camera in order to see a 35mm portion of the ruler centered around two markers when looking through the viewfinder. Making the pictures wider than the distance between the markers ensures that there will be enough overlap between the photos, which is required by the stitching software to work properly. The black rectangles serve also as references for the stitching software, to help finding corresponding areas between the photos. Year rings alone often do not have enough details for the pattern matching algorithms. The stitching process is automatic. However, manual corrections are regularly required. The millimeter division of the ruler helps with checking whether the photos have been put together correctly. To check the linearity of the stitched photo I performed a "rulertest". The "ring width curve" made from the millimeter marks drops slightly towards the right because the positioning plate is not running exactly parallel to the violin, which actually is impossible to achieve as violin tops are always arched. I have divided the 101 points of the measurement series into four segments and calculated the mean value of each segment to quantify the non-linearity. Altogether this is a perfectly acceptable result. It will probably be even better when working with flat samples. I agree that to take accurate photos of samples for dendrochronological analysis the first choice should always be a scanner. But if a scanner is not an option because the sample is not flat, as in my case, or because the sample is too big or too heavy (e.g. a piece of furniture) or for some other reason, the method I described is a practical alternative. (1) I use alternately two stitching tools: PanoramaMaker which I found on the CD-ROM that was shipped with a Panasonic camera I purchased a few years ago, and PhotoStitch which is shipped with Canon cameras. Occasionally one software struggles more than the other to put the single pictures together correctly, therefore I sometimes switch between the two. Apparently they work with different algorithms. Here you will find a list of stitching tools. However, excluding PanoramaMaker, I am not familiar with any of them. a German mail-order business for photographic equipment. (Unfortunately the site is only in German). The upper block, which carries the camera, can be accurately positioned with the knob at the front. The beam that on its part carries the upper block can be pushed back and forth to increase the effective length of the adjustment track to 380mm, despite the length of the beam being only 256mm. I have chosen for this large range in order to be able to measure double basses in one operation. More common lengths of the adjustment track vary between 100mm and 150mm. Thank you, Roberto, for this very nice presentation! And the quality of your images, produced by the described method and equipment, are indeed impressing! Core id is FHKA03a and the most narrow rings are just 0.07 respectively 0.09 mm! (and aproximately 6-9 dots) The resolution is formally 2400 dpi, but as seen not very clear. But higher resolution will unfortunately not increase the result very much, when measuring total ring widths only, according to my experience. The main problem is to really be able to detect those very small rings, which may very well be absent in parts of the circuit, and than even in very strong magnification, they are still not visible. A report (in Swedish) on the barn dating with rwl-files included are at http://www.taxelson.se/dendro/obj/FHKA.pdf . 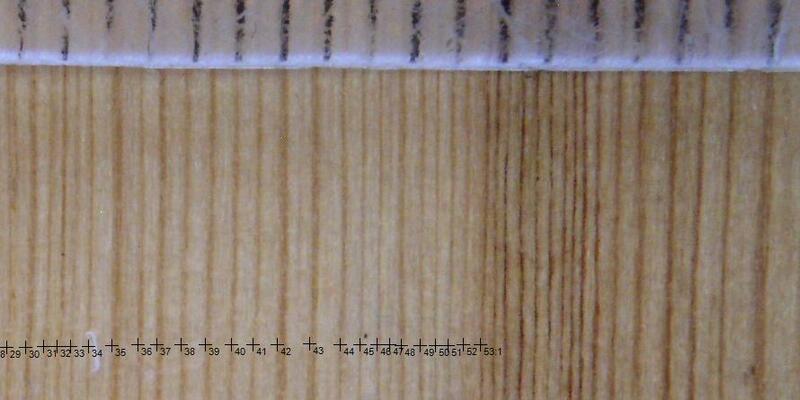 Fortunately for violin-dendro, absent rings are much more rare in spruce than in pine. 1.The surface is not plain enough. 2.The rings are too narrow (Wood like that in the example above, can be properly measured from crosscuts only) Unfortunately that kind of extremely narrow ringed wood – often even worse than that above - was often used for furnitures made in the northern Scandinavian countryside. 3.In pine tree wood, there are often white resin vessels in the late wood, which will be difficult to distinguish from early wood if the rings are very narrow. 4.The direction of the light is critical. Direct flash is useless and so also light coming from the side. It has to incline along the wood structure. I am using a Minolta Dimage F300 which is just a compact camera bought 5 1/2 years ago. It is said to give 5 M pixel but 4 M pixel mode gives as good images, so I only use that – the rest is just blur. The macro do focus at a distance down to about 150 mm between the leans and the object, and the image width is than about 45 mm. Of course this is not the optimal camera for this purpose, but the results may anyway be of some interest, to show that not only the very best equipment is useful. This camera use to be in my pocket, so sometimes I get unexpected opportunities to portray some rings! Instead of a stative just a ruler, or a piece of thin wood, could be used to ensure that the distance between the camera and the object will be the same for all the images. Just to demonstrate I used one of the 4" boards of pine tree in my floor, just here I am. This image was taken in almost optimal light, and I was able to get the camera to focus close enough to produce images with as much as 1248 dpi (if the light is not so good, the auto focus works poorer). The light have to be in the same direction as the wood, and not from the side. Even if the distortion from the camera is low enough according to the ruler test, the saw cut on a floor board is often not through the pitch and therefore the inner rings are a lot to wide. It is therefore normally not a good idea to mix such measurements in a reference collection, but if it is from an area or an age where you have not enough other data, it may be better than nothing – if shared with care... The neg-exp detrend function of CDendro will also take care of the effect If you like! In this example the narrowest ring is about 0.2 mm and I think that wood with more than 3 or 4 rings per mm is normally not datable with this method when dealing with normally sanded or planed wood. The much higher finish of violins, and the absence of the white vessels in spruce wood will surely make it possible to identify rings more narrow than that if resolution is high enough! To increase the measurement quality when the image quality is low, you may measure the same sequence twice and make a mean of them. So, using the mean of two series from the same photo it will date to 1900 towards a range of more or less local chronologies. Well, not a good match but as I know the house was build 1914 it is surely right. In this case the values are very good, although the rings also are a bit broader, I think the main reason simply is that the first tree does not give better values than that. Such corr values are indeed rather normal in this area. G9o1 #### Ring pattern caught with camera with resolution of aprox. 1200 dpi. The inner rings are overestimated due to sawing beside the pitch.